Microsoft Corporation (NASDAQ:MSFT) dropped a bombshell on us at its Windows 10 Consumer Preview Event. That sounds like the sort of grandiose posturing we hear all the time from events like the Consumer Electronics Show. But the Microsoft HoloLens appears to be far past the experimental stage. The hardware was demonstrated live, in real time onstage. It looked production-ready, not like a cobbled-together prototype. The software hooks are baked into Windows 10, and MSFT has even put together an authoring application. So what the heck is HoloLens? Is it a Google Inc (NASDAQ:GOOG, NASDAQ:GOOGL) Glass augmented reality competitor? Or will it face off against Facebook Inc’s (NASDAQ:FB) Oculus Rift virtual reality headset? The hardware part of the equation, Microsoft HoloLens is a wearable headset that’s larger than Google Glass, but far less bulky than Oculus Rift or Samsung’s (OTCMKTS:SSNLF) Gear VR. A transparent lens lets you see the real world, while high-definition, three-dimensional holographic images are projected over it. Then it tracks the wearer’s interaction with the holograms, both movement and voice. Unlike typical VR headsets, the HoloLens isn’t physically connected to a computer. Microsoft says it has massive processing power built in, including its own CPU, GPU and a third processor dedicated to holograms. The camera has a greater field of depth than the original Kinect Sensor for the Xbox to track the wearer’s hands in space. The HoloLens also has its own spatial sound system. A compact computer that’s processing “terabytes of data every second” will get hot, but Microsoft has thought of that too: the HoloLens has side air vents to keep that heat away from the head. Windows 10 will have the ability to support those holograms through Windows Holographic, built-in APIs that provide the software hooks. The technology lets developers build universal apps — ones that will run on Windows 10 on smartphones, tablets and PCs — that take advantage of the HoloLens headset. That could be as simple as Minority Report-style interaction with a 3D-projected system interface instead of using a mouse and monitor, or as complex as manipulating 3D models in midair or playing a video game that places holograms throughout your living room. Having the hardware and the universal Windows 10 support for the HoloLens takes care of the technical hurdles. But that leaves the problem of content. Without an easy way to create holographic content, the Microsoft HoloLens faces an uphill struggle. MSFT understands that, though, and the company has already created HoloStudio, an application for designing the holograms that are central to the HoloLens experience. The company says HoloStudio can even be used by creative types and enthusiasts to design their own holograms at home — it’s not something that requires the art department of a game studio to use (although obviously, game studios would be cranking out much higher-caliber content than the average person experimenting with the technology). Does HoloLens Have a Future? Virtual reality and augmented reality have had a fairly slow start, but Microsoft HoloLens has a clear advantage over many other entrants by virtue of being self-contained and enjoying system-level support. Microsoft already is talking up a HoloLens version of its $2.5 billion acquisition Minecraft video game. That could be the killer app that gets consumers clamoring for the gear. But a lot will depend on four things: price, release time frame, real-world performance and developer support. 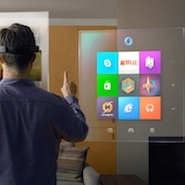 Microsoft says HoloLens will be released in the same time frame as Windows 10, which hints at late 2015. That’s likely to be early enough to prevent competitors from establishing an unsurmountable lead. The demo performance was impressive, but if that turns out to have been partially staged and the real-world performance isn’t so smooth, that will hurt adoption. Developer support is crucial, too. Minecraft would be great, but Microsoft has to convince third-party developers to get on board and churn out compelling apps using Windows Holographic — the headset won’t cut it as a novelty act. Finally, there’s the price. There clearly is some very expensive technology in the HoloLens, but Microsoft will need to price it within range of average consumers instead of the $1,500 Google was charging for Glass. If all these ducks are in a row, Microsoft HoloLens might just be the headset that changes the computer industry. IBM Stock: Is the Earnings Dip an Opportunity … Or an Omen? Article printed from InvestorPlace Media, https://investorplace.com/2015/01/hololens-microsoft-msft-windows-10/.